Viruses that spread from animals to humans are on the rise? Dr Keith Dash, veterinarian, parasitologist and former CSIRO research scientist, and the ‘father’ of WormKill, recently sent me a couple of necessarily short pieces he wrote for another purpose, and gave me permission to share them with readers of WormMail. Being the consummate team player, Keith might eschew the title of ‘father’ of WormKill, the first of the ‘modern’ Australian sheep worm control programs, but because of his involvement in the development and marketing (aka ‘extension’) of WormKill , which led onto WormBuster, DrenchPlan and others, he knows a lot about how these ‘district’ programs worked. Regarding Oesophagostomum, Keith’s PhD was on this, so I think he knows a thing or two about that as well. “The increasing problem of anthelmintic resistance in the 1980s prompted collaboration between CSIRO, the NSW Department of Agriculture and Rural Land Protection Boards (RLPBs) to design new worm control programs for the main climatic zones in the state. The first of these, ‘Wormkill’, was introduced in northern NSW in 1984 with the dual aim of suppressing H.contortus and slowing the rate of development of anthelmintic resistance in T.colubriformis. The program involved concurrent treatment at 2-3 specified times each year with closantel, a long-acting anthelmintic highly effective against H.contortus, and a short-acting broad-spectrum anthelmintic effective against T.colubriformis. The original program was highly successful and was adopted by 85% of producers but gradually lost effectiveness as resistance to closantel developed. More sophisticated programs, still using the ‘Wormkill’ name, have since been developed and introduced to deal with the constant challenge of anthelmintic resistance”. (Editorial note: The RLPBs have ‘morphed’ over the years. They were Pastures Protections Boards for a century or so, including during the 1980s, and had their genesis in (successful) NSW sheep scab eradication campaigns in the 19th century. In recent decades PP Boards became RLPBs, then Livestock Health and Pest Authorities (LHPAs), then, in the last few years, Local Lands Services (LLS) by way of marriage with Catchment Management Authorities. More here and here. As to sheep worm control programs, Your Program in WormBoss is, these days, the place to go. You won’t find better. SL). “Oesophagostomum species are members of the superfamily Strongyloidea. Adult worms are found in the caecum and colon of sheep. Oe. columbianum (nodule worm) was once a major parasite in the summer rainfall area of Australia but it is now rare after the widespread use of broad-spectrum anthelmintics. Oe. venulosum (large bowel worm) is widely distributed in New Zealand and all temperate areas of Australia but rarely causes problems. In both species, third-stage larvae encyst in the wall of the small intestine, develop to early fourth-stage larvae, migrate back to the intestinal lumen, and pass down to the caecum and colon. In Oe. venulosum 4th stage larvae continue development to the adult stage in the large intestine. In Oe columbianum some 4th stage larvae are retained in the wall of the lower small intestine or enter a second tissue phase in wall of the large intestine and are captured in thick-walled caseous nodules. This excessive tissue response may be because sheep are ‘unnatural’ hosts of Oe. columbianum, the ‘natural’ hosts being African antelopes”. There are still mobs of sheep with high worm egg counts – up to several thousand eggs per gram of faeces. Photo credit: owner unknown. Sourced from ABC Rural News. 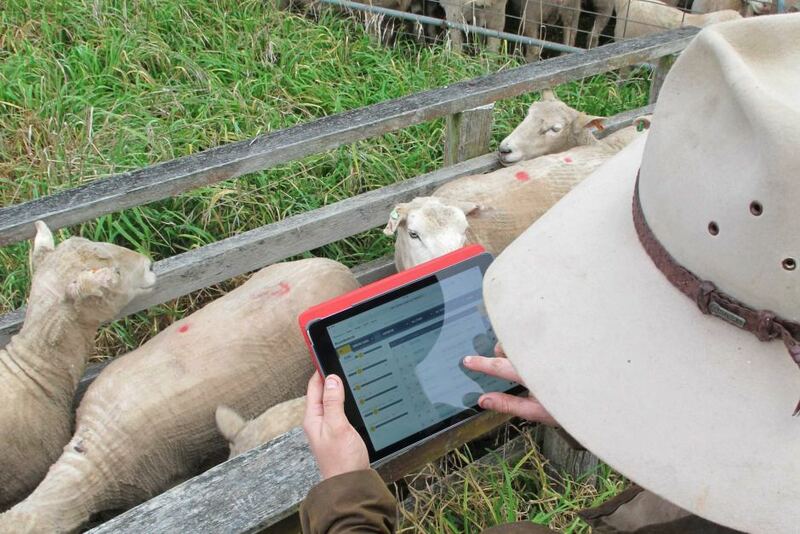 RamSelect was launched on 27 July at the Telstra Innovation Centre in Sydney by the Sheep CRC in collaboration with Telstra, NSW DPI and Sheep Genetics. Luke Stephen’s (Technical Specialist-Sheep Breeding) involvement included an intensive 4 week period working with software developers in San Francisco, as well as follow up work after returning from the U.S.
Matias Suarez (Technical Specialist-Beef Breeding) did foundational work in the form of “Bull Rank” which was licensed to the Sheep CRC for use in sheep. People within the NSW DPI (and LLS?) firewall can see the blog post on RamSelect here: https://dpiactive.dpi.nsw.gov.au/ramselect-com-au-is-online-and-operational/ Make sure you ‘like’ the blog post. (Luke may even by you a beer). In my first three veterinary ‘careers’ – private practice, semi-government field vet, and lab-bound veterinary pathologist – the common thread was that I mainly did diagnostic work and often this involved internal parasites. Despite this I seldom used pepsinogen as a diagnostic aid, so I resorted to the texts to get a better feel of how to interpret the test and how useful the test is. * older immune cattle may show elevated levels when grazing contaminated pasture, even though few worms have established. “In adult cattle, estimations of serum or plasma pepsinogen concentrations are considered a useful indicator of abomasal damage and of value in the diagnosis of type II ostertagiasis. “Pepsinogen is produced in the gastric mucosa as the inactive precursor of pepsin. Abomasal damage results in increased blood pepsinogen concentration. The assay measures the presence of pepsinogen through the ability of the test serum or plasma to breakdown a protein substrate to peptide fragments. Results are compared with a tyrosine standard, and expressed in terms of U/L of tyrosine. “Specimens required: serum, heparinised or EDTA plasma. “Activity is stable for several days at 4°C for several days and several months at -20°C. Haemolysis has little effect on activity. “Interpretation of results: pepsinogen values should be interpreted on a herd rather than an individual basis. False negatives may occur. * Levels of 5 or greater are considered indicative of damage sufficient to cause production loss. “In delusional parasitosis, patients mistakenly believe that they are infested with parasites. See! Parasites are important and they are everywhere – even in your imagination. In the meantime, attention to the basics like hand hygiene, other aspects of hygiene, and managing risk, can make a big difference. WRML.2015-07-03.paraboss polls prizes.wormy weaners in winter.worm injects sperm.greece-5things. At the top right hand corner of the home pages for each of the Boss sites (WormBoss, Flyboss, LiceBoss), there is a poll we (the ParaBoss team) would like you to take. After you answer (it takes just a few seconds), you will be told what the other responses have been so far. Also – subscribe or update your P-Boss News sub (June/July 2015) and maybe get a prize. (I get nothing: I do it out of love). If you read the recent ParaBoss News (June 2015) – and you really should – you will have seen in the NSW State outlook that Rad Nieslen (VHR Armidale) and others have reported that some mobs of weaner sheep in different parts of the state have had high worm egg counts. Often, but not always, this has been due to Haemonchus – barber’s pole worm (BPW). Concentrating on BPW: what gives? Isn’t BPW a ‘summer worm’? Well, mostly yes. So, why can it be a problem in winter, including tablelands areas where winters are cold (by Australian standards)? The eggs of BPW are its Achilles heel. The eggs are short-lived, and they are cold- and desiccation-intolerant. For more detail see WormBoss (specifically, here and here). But, adult BPW females are highly fecund, so, when conditions are just right, the worm eggs on pasture may be there in large numbers. But the infective or 3rd stage (L3) larvae are a different story. The L3s of the most important round worms of small ruminants (Haemonchus, Trichostrongylus, Teladorsagia) are relatively long-lived, with death rates being lower in cool weather and higher in warm to hot weather. So, for example, in the NSW tablelands it might take several months for most of the L3s to die off in winter, but only half that time in summer. In the tablelands, late spring through to autumn is generally warm enough for BPW eggs to develop and hatch out larvae. All that is required is enough moisture. In a good season – good for worms and grass – there will be plenty of L3s on pasture come the cold weather when the BPW cycle grinds to a halt. But the L3s will carry the BPW team flag through winter – our winters at least – with some making it through to spring. Yes, the old married persons’ tale that BPW dies in winter is only half true. And half truths can be dangerous. Drench resistance compounds the problem. Many, many producers unwittingly use drenches that are not highly effective. Resistance is so common, whereas checking drench efficacy is not. Only a small proportion of farmers do regular worm egg count monitoring, and drench efficacy testing, e.g. DrenchCheckDay10. Alas, producers, like the rest of us, are human too. Animal Health Australia (AHA) and the Australian Alpaca Association have developed a new tool in the fight against disease, with the introduction of the National South American Camelid Declaration and Waybill.